Battle Lines, a flash piece about trapped enemy soldiers talking to each other over a blast door loudspeaker, is reprinted this week in issue #11 of Fantasy Scroll Magazine. Battle Lines was one of the first stories I ever wrote at the flash fiction length, way back in the fabled year of 2012, which gives me warm fuzzies. This story also holds the distinction of being the only thing I've ever read out loud to a roomful of people while clutching a piece of paper like my life depended on it. I read it at a Barnes & Noble Flash Slam while attending Odyssey Workshop in 2013. Battle Lines was originally published in Plasma Frequency. I'm particularly happy to see this one published a second time, because it's got a different (better) ending now, thanks to some feedback from my Odyssey classmates the week before the flash slam. That same week, I got the Plasma Frequency acceptance for the original version, so it was published without the tweaked ending. Now I feel content knowing the story is out in the world in its final form. This story, Battle Lines, was recently reviewed at www.exftc.com. It is a shame about Plasma Frequency folding, but which issue had the original version of this story? Ah, sorry it took so long for me to reply. Your comment got caught up in my spam filter. 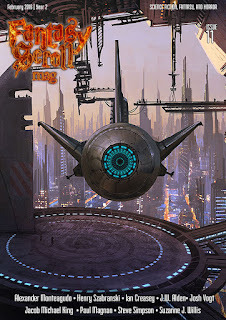 The original version of Battle Lines was published in Issue 7 of Plasma Frequency, from August/September of 2013.